A couple of years ago I bought my lathe. 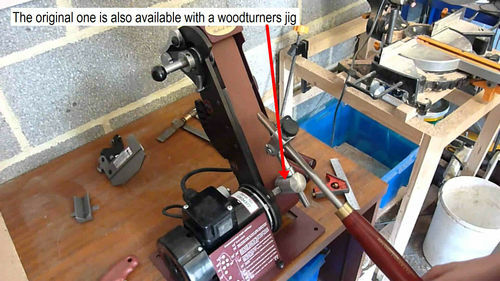 From time to time I use him as a lathe (mostly he is used as a disksander) and in particular for cylinders. 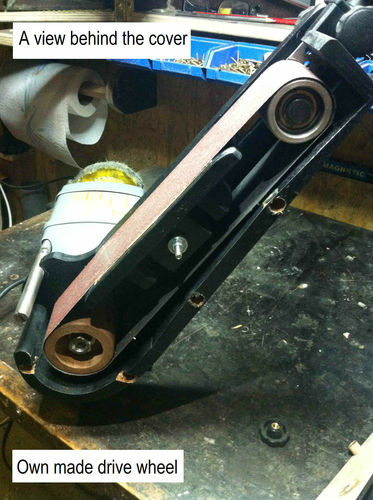 For making the cylinders I use TC tools with changeable knives. I also have a couple of HSS turning tools. Till now I could not sharpen them as I would like. 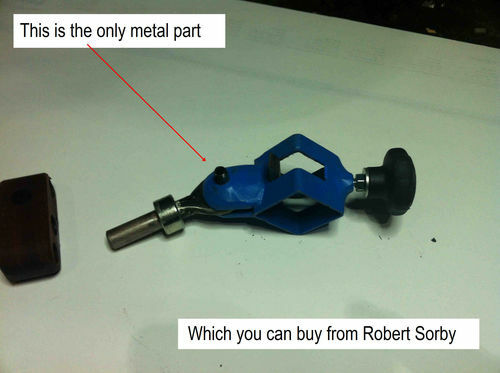 I like the Robert Sorby ProEdge, but with a price of more than Euro 600 too expensive for me. So last week I decided to give it a try to build my own and for me it was successful. Started with a cheap far east grinder that was bought a time ago. 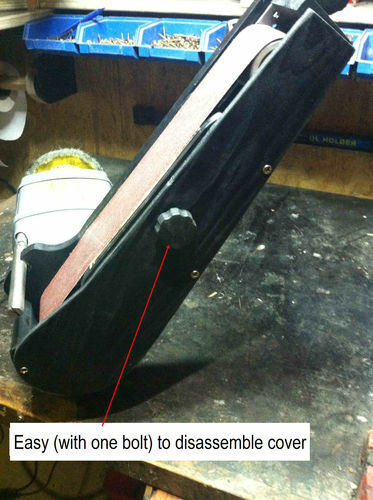 Looks like you did a great job of making your own sharpening unit. 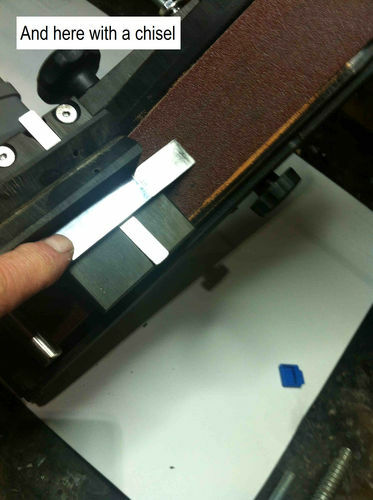 For myself, I don’t like belts for sharpening. I prefer a stone. Not that there is any thing wrong with belts, just my preferance. 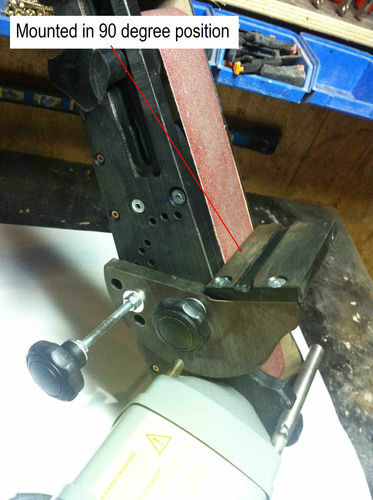 For my lathe tools I use a grinder and a Oneway wovlerine jig. I find it works very well. To me it looks they work in principle,the same. I have had a cheap wet grinder. For me to slow and with a very soft stone. 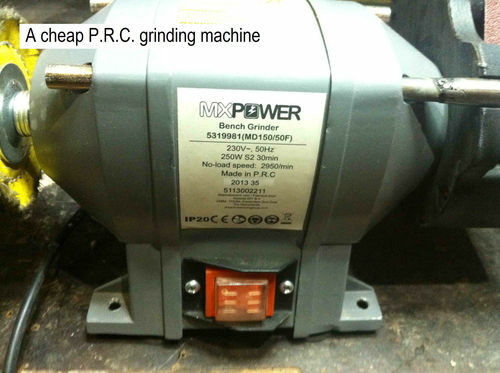 I sold this wet grinder. Hope I made a good choice for a belt instead of a stone. The future will tell. 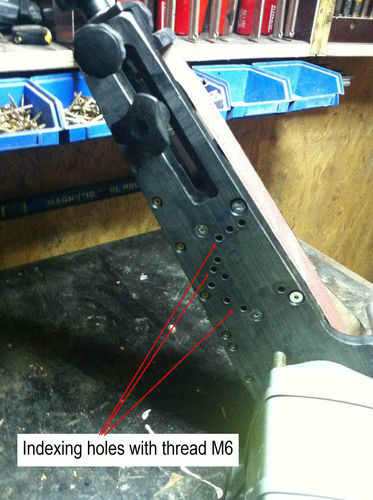 There’s something about making your own tools and jigs that’s just so much fun. I also love to see what others are making and get ideas. Timing is everything and I missed this one by a day. Sad but true. 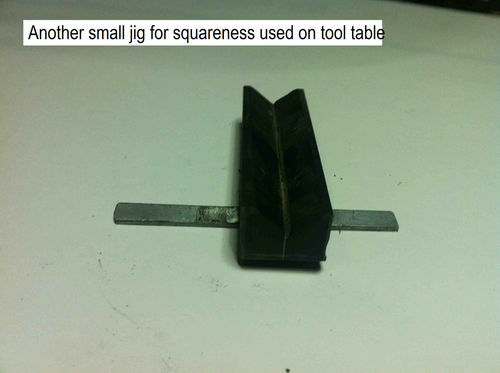 Well done I am sure this will work fine, I really have failed sharpening and have but very few edged tools I do have a couple old stones and a couple small planes but truth be told I use them very little. I am also sure if I would try ,my work would improve. good luck with your machine it looks like it will do a fantastic job for you. Dee I’m in the same boat and was going to mention it but thought not to. Gee Jan … is there anything you CAN’T do ??? I’m TERRIBLE at grinding my lathe tools. 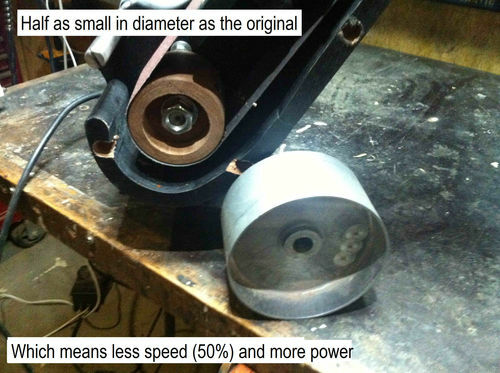 I’ve been thinking a slow-speed grinder is my best bet, because I have burned the edges too many times. 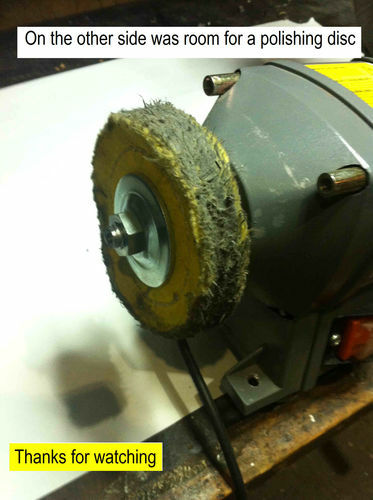 Great job on the grinder. Dee and Bruce I,m also a lazy sharpener. 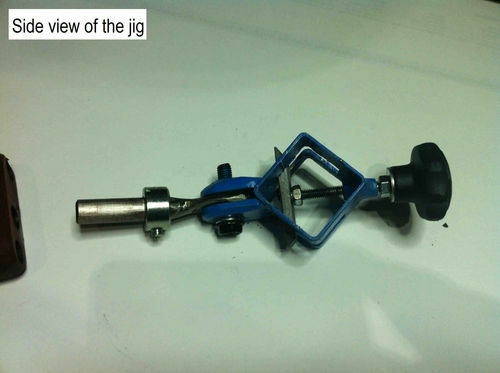 But I know that special for turning work it is necessary to have sharp tools. 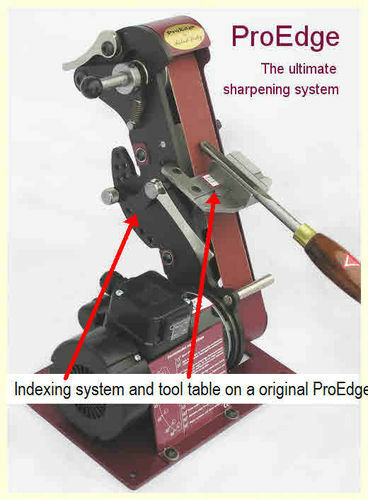 That is why I took the time to make this lazy sharpening system. It was a week of work and I hope from now on it will be getting better with sharpening my tools. Joe you have burned your tools many times. 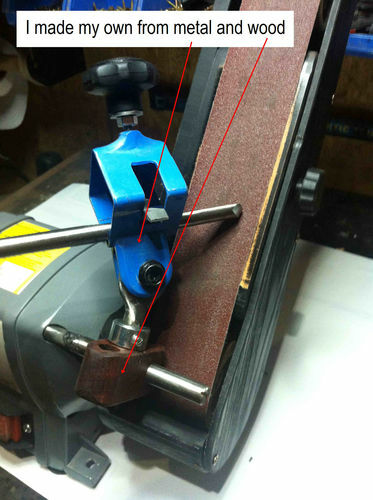 Do you have a tool to flatten and clean your grindstone? Gee Jan … is there anything you CAN’T do ??? A lot Joe. But it’s soooo cheap. HELP!!! Very nice. I wish I had the tools and talent to do the metal work. 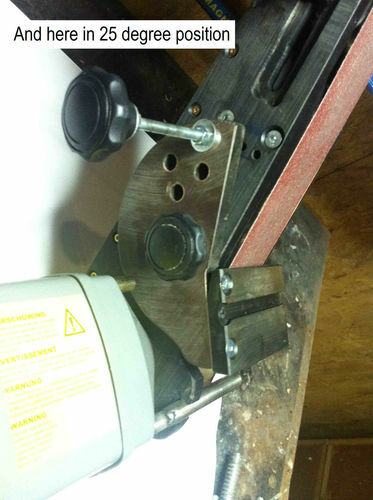 I made a similar Pro-edge clone for my home made belt sander but it is not nearly as solid as this looks. I may borrow some of your ideas for improving mine. 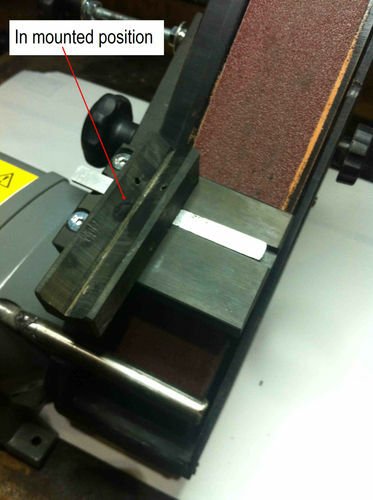 Maybe you didn’t notice but there iis with the exception of the woodturning sharpening jig almost no metal work. The sturdy base I made is from 12mm thick Trespa. 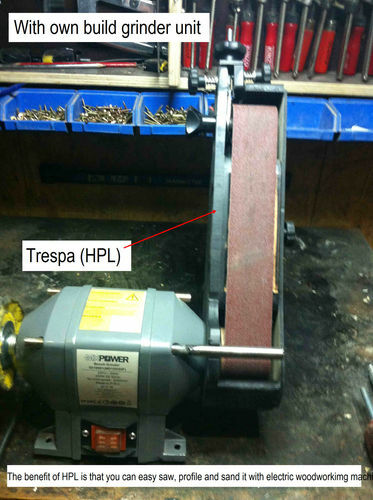 Trespa is a high pressure laminate. 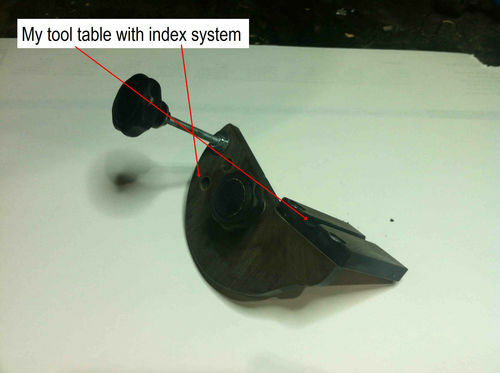 The benefits of this material is that you can shape it with power woodworkers tools. 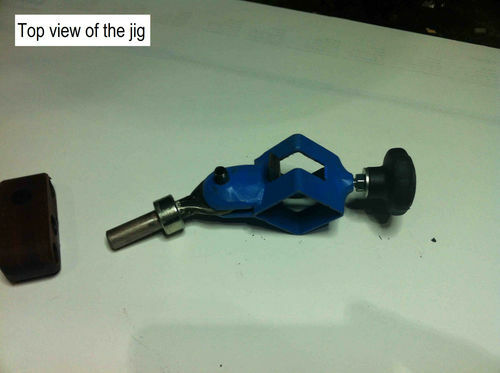 But it is also easy to make screw-thread in it, The only metal part is the sandpaper spanner, but you can do it without. The upper wheel is from the cheap P.R.C. 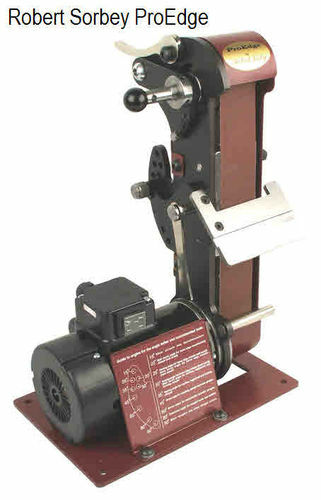 grinder, but also this one you can make out of wood (If you have a lathe of course) The metal parts are bolts, rods nuts and bearings. Oh, thanks. I didn’t notice the material wasn’t metal. I’ll have to look into those materials to beef up my next version. 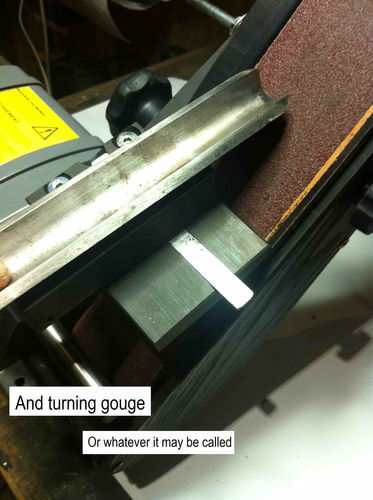 There are many ways to sharpen and they all work. 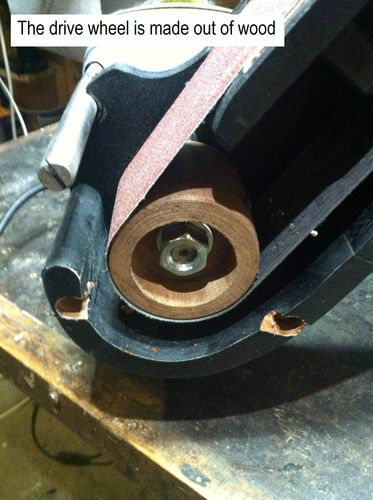 You did a great job making this sanding sharpener and it was a good idea with the smaller wheels to slow it down.